On Sept. 20th this year, the world woke up to some important news. When opening the newspaper that morning you would have been confronted by headlines describing the results of an extremely interesting experiment. The experiment involved giving the drug Ecstasy to octopuses. As we shall see, the drug seemed to make the octopuses more “touchy, feely” and generally sociable. But why would anybody want to give Ecstasy (aka E, XTC or Molly) to an eight legged mollusk anyway? It turns out that, although not obvious at first glance, humans and octopuses do have certain things in common, although they diverged evolutionarily from each other some 500,000 years ago. One of these things is a well-developed nervous system. Naturally, there are many differences, but an octopus is about as intelligent as a mollusk can possibly be and its brain is pretty big. Indeed, there are quite a few well known example which attest to the intelligence of octopuses. Most recently, perhaps, is the story of Paul. Paul was an octopus who was born in Weymouth, a seaside town in Dorset, UK, but who lived for most of his adult life in an aquarium in Northern Germany. At some point he began to develop a reputation among his owners as a seer. 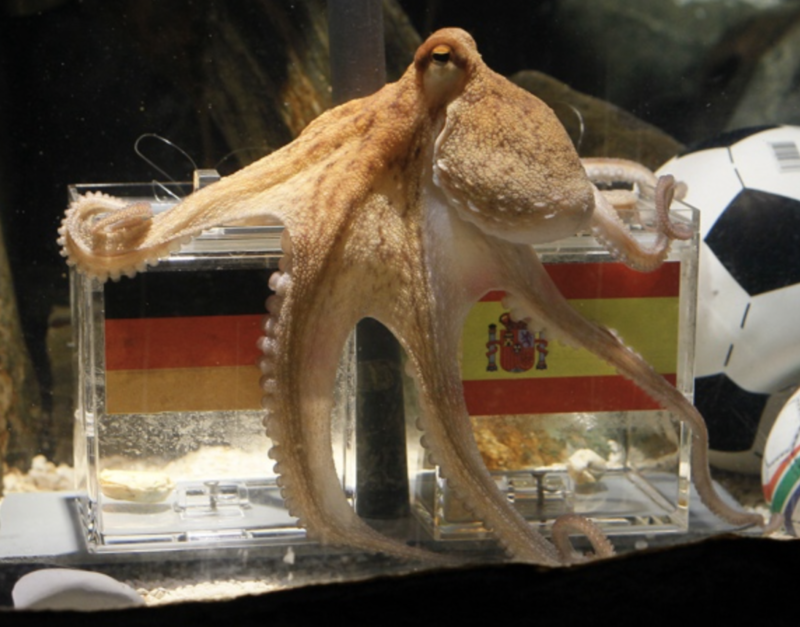 In order to demonstrate the clairvoyant abilities of this molluscan medium to the world in general, Paul was asked to predict the outcomes of all of the games Germany played in the 2010 World Cup. Paul’s owners placed two glass boxes in his tank, each containing a tasty mussel. The two tanks were wrapped in the flags of the competing countries. On the appropriate command Paul was asked to retrieve the mussel from the glass box representing the team he predicted would be the winner of the upcoming game. Paul predicted the results of all eight games correctly, even a couple that Germany lost to Serbia and Spain. Paul’s remarkable psychic feat was probably the most memorable feature of what was a rather lackluster World Cup from the footballing point of view, and illustrates just how intelligent these creatures actually are when examined in a human context. Indeed, although animal seers have been employed to predict the results of all World Cups, none has been remotely as successful as Paul. OK, so octopuses are intelligent, but why would you want to give Ecstasy to an octopus? To understand the reasoning behind this experiment we first need to understand the properties of the drug and the effects it produces. found, for example, in the natural product mescaline, obtained from the peyote cactus Lophophora Williamsii, produced strong hallucinogenic activity similar to drugs like psilocybin and LSD. These properties are completely different from the effects of amphetamines to which they are closely related chemically. Shulgin made hundreds of synthetic phenethylamine derivatives to try and determine which structural features made a substance a hallucinogen rather than a psychostimulant. During this process he produced some extremely powerful hallucinogens that rival LSD in their potency but were based on the phenethylamine structure rather than being tryptamines like LSD. At some point Shulgin synthesized MDMA and found that it had unique properties that distinguished it from both the phenethylamine psychostimulants and hallucinogens. MDMA appeared to be the prototype of a whole new class of drugs which were named “entactogens” (literally “to touch within”) by Shulgin’s student Dr. David Nichols, also a distinguished medicinal chemist working in the field. Although some drugs in the entactogen class do show a tendency towards psychostimulatory and hallucinatory activity, that is not their major characteristic. Entactogens (also sometimes known as “empathogens”) produce a feeling of emotional openness, sympathy, empathy, sociability and intimate connection to other individuals. It turns out that Shulgin wasn’t the first person to synthesize MDMA. Its original synthesis occurred many years earlier in Germany as part of the ongoing rivalry between the pharmaceutical giants Bayer and Merck in the early part of the 20th century. Bayer had developed a useful “styptic” or hemostatic agent (i.e. one that stops you bleeding). It’s the kind of thing that is an ingredient in styptic pencils which can stop the bleeding of shaving nicks and similar small cuts or abrasions. This substance was called hydrastinine and was itself a derivative of the natural product hydrastine isolated from the goldenseal plant (Hydrastis canadensis), a relative of the buttercup. 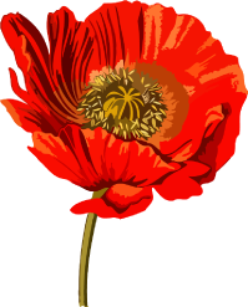 Anton Kollisch, who worked for Merck, synthesized MDMA in 1912 as a chemical intermediate that could be used in the synthesis of hydrastinine-like substances in a way which would get around Bayer’s patent coverage. Merck named the new chemical methylsafrylamin. Although the chemical similarities between MDMA and amphetamine will be clear to us today this wasn’t the case in 1912 and Merck had no idea that they had created a psychotropic drug. Indeed, nothing is really known about the fate of MDMA until the 1950s and 1960s when the CIA’s secret MK-ULTRA brain washing program started to test different substances that they thought resembled mescaline. However, whatever the results, the drug didn’t seem to generate much interest with the CIA whose attention quickly turned to super potent hallucinogens like LSD. Shulgin was so impressed with effects of MDMA that he told a psychotherapist friend of his named Leo Zeff about it. After experimenting with the drug Zeff, like Shulgin, became impressed with its potentially beneficial effects and proceeded to use it as an adjunct to psychotherapy sessions. Indeed, the use of MDMA for such purposes became very popular with therapists at the time who believed it encouraged the psychotherapeutic expression of a number of features including increased empathy and openness, allowing the patient to reveal highly charged and traumatic emotional material. Indeed, it has been estimated that some 4000 therapists were regularly using MDMA at this period. However, it wasn’t just in the area of psychotherapy that MDMA began to exert its influence. The effects of the drug on fundamental aspects of interpersonal interaction, together with its psychostimulant properties, made it ideal as a popular street drug. During the late 1970s and early 1980s MDMA began to gain popularity with participants in “Rave” events, large scale dance parties accompanied by electronic dance music held in large auditoria or abandoned buildings, frequently outside the supervision of normal law enforcement. Figures show that at some of these events >90% of the participants took MDMA or an equivalent substance. And the use of MDMA as a rave drug has never gone away. It is estimated that during the period from 1980 to 1985 global MDMA use increased by 4,000 percent. In the first five months of the year 2000, over four million doses of the drug were confiscated by United States authorities alone. In response to all of this activity in 1985 MDMA was classified as a Schedule I controlled substance in the USA during an emergency session of the Drug Enforcement Agency (DEA). Drugs with this classification, which include heroin, are described as extremely dangerous and without any bona fide medical applications. Hence, from that point in time, MDMA disappeared from the world of mainstream medicine and science and was generally unavailable to researchers who wanted to investigate its properties. It is worth noting that many other street drugs that have become popular since the 1970s are also variations on this same chemical theme. Many of these are derivatives of cathinone, a natural product derived from the plant Catha Edulis which normally grows wild in areas around the Horn of Africa (see Feb 2018 blog post). There are an almost infinite number of variants that can be synthesized based on the phenethylamine/amphetamine structure. The cathinone derived series have become available on the Internet under the general title of “Bath Salts”. 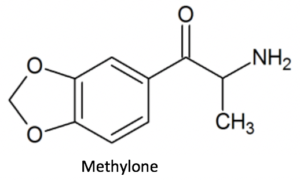 Some of these structures such as methylone combine the chemical features of amphetamine, cathinone and MDMA, resulting in drugs with a unique spectrum of effects. To understand the significance of the MDMA/octopus experiment we also need to know something about the mechanism by which the drug produces its effects. The main targets of the drug are the biogenic amine neurotransmitters, dopamine, norepinephrine and serotonin (5-hydroxytryptamine). The nerves that use these neurotransmitters in the brain are concentrated in groups known as nuclei, mostly situated in the midbrain and surrounding areas. Actually, there aren’t that many nerves that utilize these neurotransmitters but they send out numerous axons that innervate many different parts of the brain and spinal cord and so they exert an extremely broad influence on many brain functions. There are three major ways in which phenethylamine derived drugs can influence these neurotransmitter systems. The biogenic amine neurotransmitters are stored within vesicles in the nerve terminal; tiny packages waiting to be released into synapses when the nerves are stimulated. Once released, the biogenic amines exert their effects on other nerves by interacting with one or more biogenic amine receptors localized in the vicinity. There are a large number of these receptors and the effect produced by a biogenic amine when released from the nerve terminal will depend on which receptor it interacts with. Once their job is done the neurotransmitters are shuttled back into the nerve terminal by biogenic amine uptake pumps and recycled. Imagine what would happen if a drug acted to block one of these uptake pump proteins? Now the neurotransmitter would spend more time activating receptors because it would not be removed from the synapse. So, for example, drugs known as SSRI’s (Selective Serotonin Reuptake Inhibitors) block the reuptake of serotonin and allow it to activate its receptors more efficiently. These drugs tend to produce antidepressant effects, as do drugs that block the uptake of both serotonin and norepinephrine into their respective nerves. If a drug is also able to block the uptake of dopamine its characteristics change and it acquires increased psychostimulant properties. Such drugs are also usually highly addictive. Another kind of mechanism is typified by the drug amphetamine. Amphetamine-like drugs can actually enter the nerve terminal and block the uptake of biogenic amines into their secretory vesicles. Because of this action, the concentration of biogenic amines builds up in the nerve terminal and the molecules can leak out into the synapse using nerve terminal uptake proteins in reverse. A third kind of action is typified by drugs that activate receptors for biogenic amines directly. For example, hallucinogenic drugs like LSD or the hallucinogenic phenethylamines like mescaline, directly activate serotonin receptors, and 5HT2A receptors in particular. 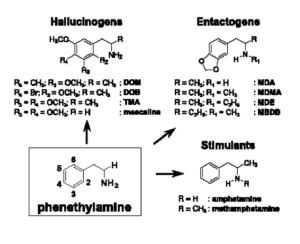 Overall, the many thousands of psychotropic phenethylamines combine these different actions to different extents, each one producing a unique set of behavioral features. The idea is that one day it will be possible to synthesize structures that precisely produce any set of features that the user desires -the so called “designer drug” phenomenon. If we look at the properties of MDMA, in particular, we find that it has powerful amphetamine like serotonin releasing actions together with lesser effects on the dopamine and norepinephrine systems. Central synapses that utilize serotonin, therefore will be of primary importance when we consider the effects produced by MDMA. One thing that we know about serotonin is that it is an extremely ancient molecule being found in plants as well as animals. In plants, serotonin’s precursor, the amino acid tryptophan, plays an important role in the absorption of light and, in addition, acts as a chemical intermediate for producing auxins, important plant hormones. In animals, the role of tryptophan and serotonin in responses to light is maintained as they act as precursors to the hormone melatonin a key regulator of circadian rhythms. Serotonin utilizing neurons are one of the first types to emerge from the midbrain during development and extend their influence on the cortex and the rest of the developing brain. Serotonin signaling, then, is a good candidate when we want to consider how ancient behaviors are controlled. Social behaviors of one type or another are a characteristic feature of most animals. But how conserved are these behaviors from the biological point of view and what mechanisms produce them? Given the well-known effects of MDMA on increasing sociality, one might wonder if such effects would also show up in an intelligent animal such as an octopus whose family tree split off from that of humans some half a billion years ago. As it turns out, social behavior is highly regulated in octopuses which usually display rather solitary behavior, except when it comes to mating. Would we expect MDMA to produce effects in an octopus? First of all do octopuses even have the serotonin transporter protein (usually known as SERT-serotonin transporter) which is the site of action of MDMA in mammals like humans? The authors of the recent paper (1) investigating this question began by constructing an evolutionary tree of SERT amino acid sequences. They found that the gene that codes for SERT, which is called Slc6A4, was indeed present in octopuses, although not in all animals. In fact octopuses have two copies of this gene, the result of what is known as a gene duplication event. However, that isn’t the only significant thing. The sequences of particular proteins differ from species to species. The precise amino acid sequence that allows MDMA to interact with the SERT has been mapped. Interestingly, this sequence is completely conserved in octopus SERTs meaning that it is likely that MDMA could interact with the protein in the same way that it does in humans. We know that MDMA produces increased sociability in humans, so what would happen in an octopus? other side chamber they placed an octopus in a cage. This octopus could be male or female. They then took another octopus and placed it in the central chamber to see what it would do. They observed that if the octopus in the cage was a male, then the exploring octopus would avoid it and spent much more time with the football. Moreover, even when the exploring octopuses did spend time with the male in the cage, they weren’t very friendly towards it, perhaps just extending one limp wrist in the direction of the caged mollusk. Then the experimenters put MDMA into the water for 10 minutes. 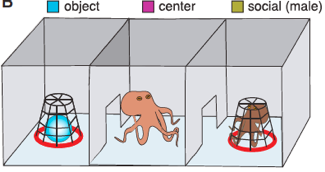 Now the octopus’ behavior changed. Instead of avoiding the male octopus in the cage, the exploring octopus spent much more time in its company and much less with the football. What is more, the character of the interaction changed. Now the exploring octopus examined the caged octopus with a full-on eight arm press. In other words the MDMA had a pronounced prosocial effect on octopus behavior, just as it does in humans. It seems, then, that the ability to exhibit social behavior does exist in the octopus but it is normally suppressed except during mating. This suppression can be overridden by activation of the serotonin utilizing portion of the octopus nervous system. The results suggest therefore that some aspects of social behavior are not only ancient but are controlled by the same neurotransmitter systems throughout evolutionary history. Such things may not be unique to social behavior. Other drugs that interact with the serotonergic system may reveal other ancient behavioral motifs. Drugs like LSD that stimulate 5HT2A receptors encourage mystical states of consciousness and a profoundly transcendental view of the world characterized by hallucinations and discursive thought patterns. These types of mental states also appear to have an ancient history and, as suggested by thinkers like CG Jung, may be hardwired into our nervous systems. Whatever the truth of the matter, the effects of drugs that interact with the central serotoninergic systems have already proved to be therapeutically useful, as in the case of SSRIs. Drugs like MDMA and hallucinogens like LSD, psilocybin and mescaline also show promise for treatment of diverse types of psychopathology as recognized by psychotherapists in the 1960s and 1970s prior to the use of these drugs being banned. There are now signs of a revival of interest in these drugs as indicated by a clear increase in studies of their effects in animals and humans using newer methodologies like brain imaging. Perhaps, if the results on our molluscan relatives are anything to go by, these agents will end up becoming useful drugs after all. A Conserved Role for Serotonergic Neurotransmission in Mediating Social Behavior in Octopus.